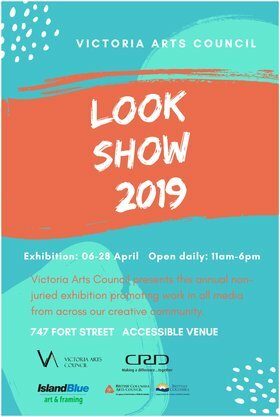 The return of the Victoria Arts Council's most anticipated event each year -- LOOK SHOW 2019 is taking place 6-28 April at a brand new location! Please join us Saturday 6 April from 1-5 PM for the opening reception of LOOK SHOW 2019 @ 747 Fort Street, a temporary site to house this enormous community art show. There are over 100 artists showing this year, working in all media from watercolour to poetry and performance to installation... something for and from everybody! This year we are featuring solo shows by: Maria Curcic, Rose Cowles, Paul McNair, and Dallas Segno to augment the group exhibition. There will also be SUNDAY SALONS April 14, 21, and 28th beginning at 2PM, where artists will offer informal discussions about their work and practice. This is an opportunity for the public to get insight into what the artists are doing as part of their art practice. These Sunday Salons are open to everyone. LOOK SHOW 2019 is open daily from 11am-6pm; by donation; full accessible.